The main purpose of metal smelting is to provide high quality metal melts for ingots.Therefore, it is necessary to study and determine the common rules in the smelting process of various pure metals and their alloys, so as to provide theoretical basis for formulating reasonable smelting process. A series of physicochemical interactions take place between solid pure metal or molten alloy and furnace gas, lining and slag.In the smelting process, metal reacts with oxygen to form metal oxides, which results in the loss of metal that cannot be recovered. At the same time, the formation of metal oxides is the main cause of impurities in ingots. 1) The oxidation and decarbonization of the workpiece surface during heating are completely eliminated, and the clean surface without deterioration layer can be obtained. This is of great importance to the improvement of the cutting performance of those tools that only grind one side during grinding. 2) It does not pollute the environment and does not need to dispose of three wastes. 3) The accuracy of furnace temperature measurement and monitoring has been greatly improved. The indication value of the thermocouple and the furnace temperature are up to 1.5 C. However, the temperature difference in different parts of a large number of workpieces in the furnace is large. If the forced circulation of rarefied gas is adopted, the temperature difference can still be controlled within the range of (+5) C.
4) High degree of mechatronics. On the basis of improving the accuracy of temperature measurement and control, workpiece movement, air pressure regulation and power regulation can be programmed in advance, and quenching and tempering can be carried out step by step. 5) Energy consumption is significantly lower than that of salt bath furnace. 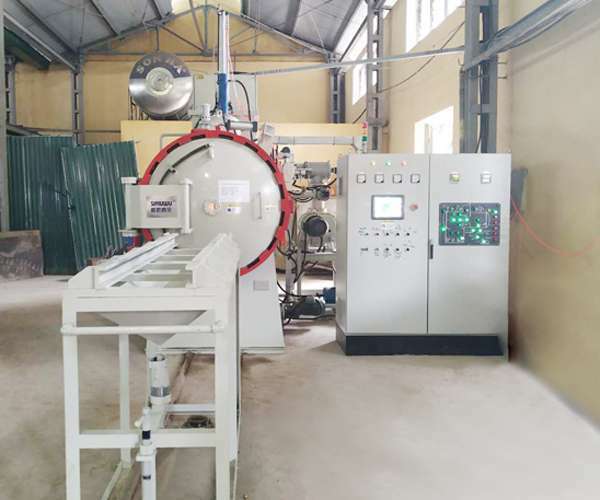 Modern advanced vacuum furnace heating chamber uses high quality insulation material to make insulation wall and barrier, which can highly concentrate the electric heating energy in the heating chamber, and the energy saving effect is remarkable.